Perennial. Zone 1/2. Scrophulariacea. North America; in Canada throughout the southern third of B.C. east of the Cascades and west to the Rockies, and in the United States common in Washington, Oregon, Idaho, Montana and Wyoming. A.k.a. 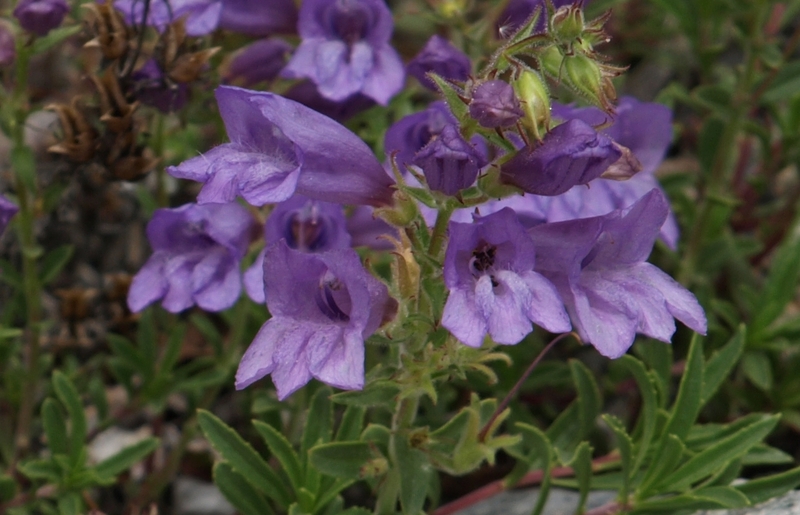 Shrubby Beardtongue, Scouler’s Penstemon. In bloom from May until July, depending on elevation, this floriferous sub-shrub is unmistakeable when seen on the roadside. 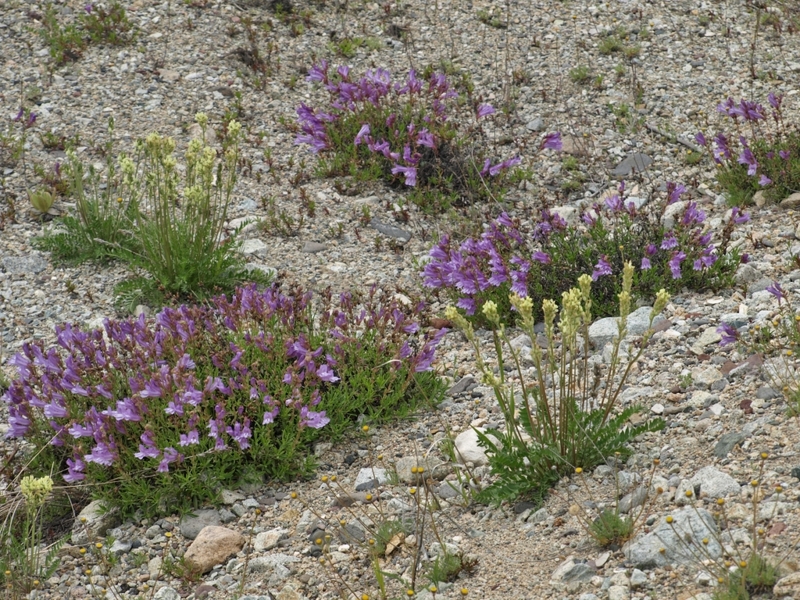 It favours steep rock bluffs, gravel pits and roadsides, flourishing best in well-drained, rocky/sandy soil. 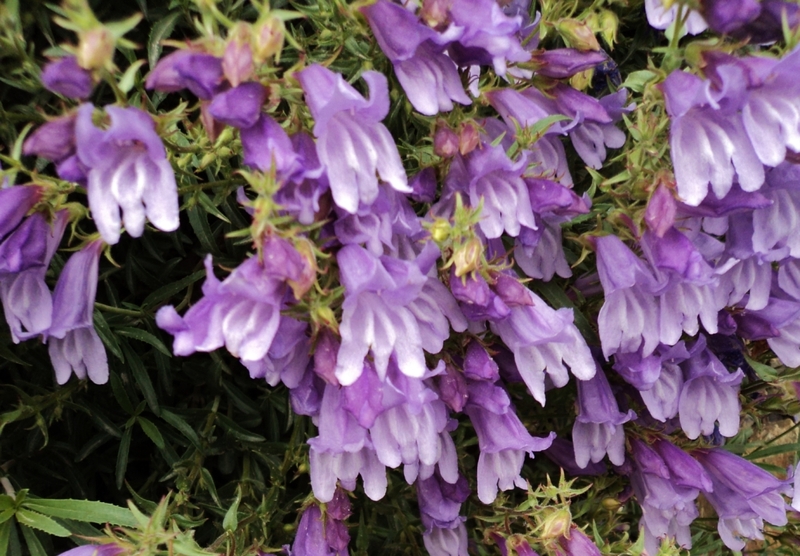 Its pale purple blooms range in shade of warm violet to cool mauve, with occasional (very rare) white sports. This subshrubby species is described by its name, fruticosus meaning shrub-like. It is a variable species, but in all its forms is very beautiful. Choice forms are easily obtained for the garden by taking short cuttings, which root very readily in sand…To keep the plants attractively compact and floriferous, they should be given gritty soil with very little food. 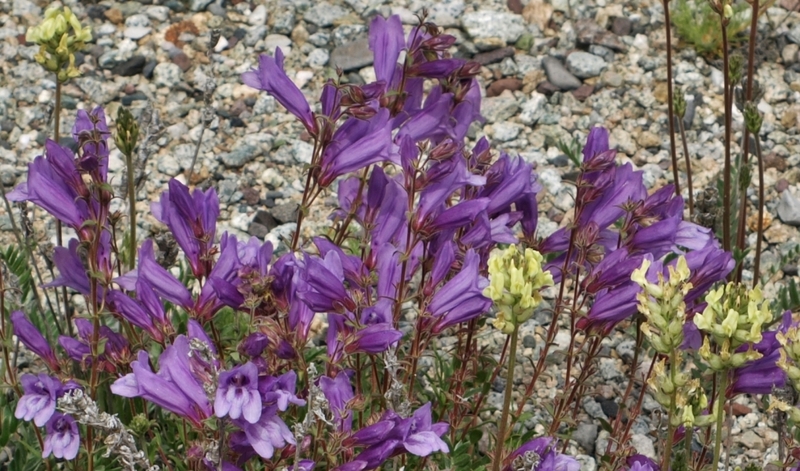 According to Plants of Southern Interior British Columbia (Parish, Coupé, Lloyd – Lone Pine Publishing – 1996), traditional First Nations’ uses of this plant included the production of a dye to colour basket-making materials, in pit cooking to flavour root vegetables, and medicinally as a purgative, and to bathe sore eyes and sooth ulcers, wounds, and arthritic joints. 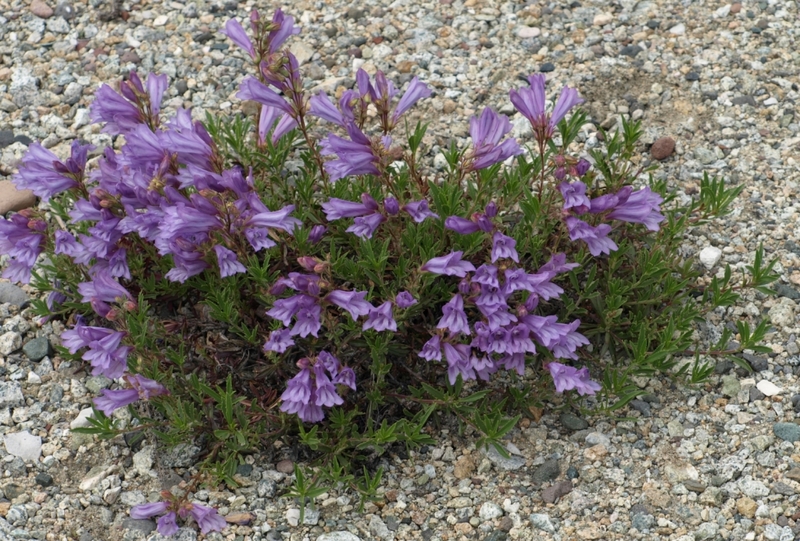 Though in general removing plants from the wild to the garden is frowned upon, in the case of this penstemon all of my guidebooks mention how easy it is to establish from stem cuttings rooted in grit or sand, and as this technique will not harm the parent plant, one may in good conscience give it a try. Seeds are abundantly produced in pointed capsules, but are difficult to germinate, so might not be the best way to obtain this lovely species. This is definitely a plant for a specialized location, requiring full sun and extremely well-drained soil to thrive, as evidenced by its flourishing in pure gravel in the wild. It would be wonderful in a rockery where it could cascade over a border or down a slope. Bloom time is relatively short, a few weeks in late May and early June, but the plants stay reasonably attractive throughout the rest of the growing season. A good xeriscape plant. 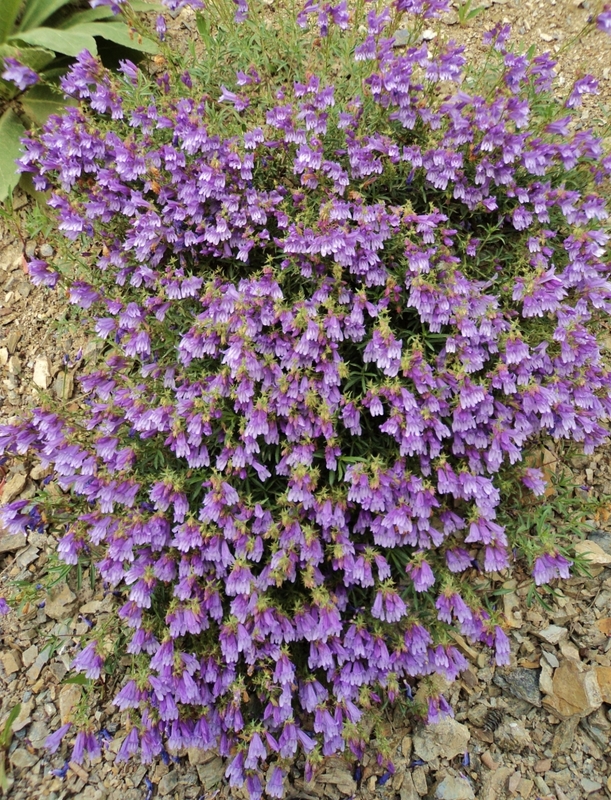 Shrubby Penstemon and its many fellow species are much favoured by bees and hummingbirds, another point in favour of stopping to observe this plant in the wild, and of incorporating it in the garden if one has a favourable spot.